Posted on October 23, 2018 by DanielC. Variant, written by Robinson Wells, is a well-written mystery/ thriller novel. The book follows Benson Fisher, a foster child who grew up in Pittsburgh. In the story, Benson applies to a private school and gets in! But this is not a regular school. Even though this school is very nice, has good food, and nice people, it also has no teachers or gangs, and the school is completely isolated from any outside world interactions. When I first started reading this book, I immediately thought it was really good. Wells introduces you to the characters, the school, and the story easily and naturally. I also loved all of the twists and turns in this book; they definitely add to the storyline. Benson begins to get used to life at the school. He has new friends, eats great food, and even begins to like a girl, Jane. But, just as life is beginning to become comfortable, it goes downhill. One night, Benson and Jane decide to go out for a walk. During the walk, the two get attacked from behind and Benson is knocked out. When Benson wakes up, he finds Jane’s beaten body. Worse yet, she turns out to not even be human but an android! When I first figured this out, I was so shocked! I did not expect this twist at all and when it came, it blew me away! Because of all the twists, I never knew what was coming or what to trust. This was a major factor in why I liked this book so much. After this major twist, Benson cannot stand his school and tries to recruit people to escape. The small group of rebels all tries to escape but only Benson and his friend Becky succeed. The book ends with an injured Benson and Becky left alone in the forest. I enjoyed this book so much and really look forward to reading the sequel. My favorite character is Benson because he is always loyal and never gives up. Thrilling and exciting, Variant is a great novel for eighth graders and above. Variant by Robinson Wells is available for checkout from the Mission Viejo Library. Posted on February 21, 2018 by Megan V.
From this beloved author we were told how Lewis Carroll wrote the stories wrong: how Wonderland is actually not a child’s world, but one of twisted madness, Tim Burton like worlds, and hot guys who wear hats and vine like tattoos. Now, get to learn that we also have a beloved opera that has been written wrong. Enter into a world based in France, where the school Rune Germain has transferred to has its own Phantom of the Opera. Rune’s life is complicated: she was almost killed by her grandma, nearly killed a boy by kissing him, and on top of all that, her voice was cursed, causing her to let out faint sounds every time she sings. Meanwhile, young Thorn lives with a man named Erik, who is the phantom of the opera and has mask covering the burnt portion of his face. Thorn must do what Erik says, even if it is wrong, for reasons kept secret. What happens when Rune and Thorn’s destined fates cross? A lot basically, and not all of it good. I love A. G. Howard as an author, especially with her Splintered series. That was why, since I saw the book at the library, I immediately picked it up and started to read it. The cover and colored ink on the inside looked very similar. Although not the same madness like tone that the Splintered series was written in, the mystical feel suits a archaic opera like time. The plot twist is also very interesting. However, the book disappointed me in various ways too. For example, A. G. Howard, like always, expects you to remember the mysterious boy that appears in the girl’s dreams, the one that only appeared for one sec in the beginning and was not memorable enough. Additionally, compared to the Splintered series, she tells the story really fast. This is also more of a preference, but I didn’t like the way she told the story. She told the story through both Rune and Thorn’s point of view, and while both are important to the story, I feel as though it muddles things up. However, that is more personal. All in all, it was still a very great story and I would recommend it to everyone who wants to read it cause of the author, supernatural elements, or the like. 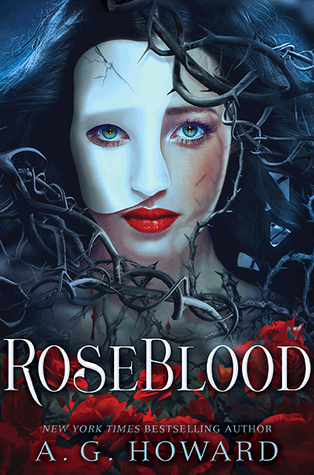 Roseblood by A. G. Howard is available for checkout from the Mission Viejo Library.